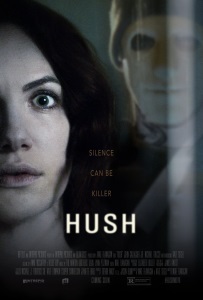 A deaf woman is stalked by a psychotic killer in her secluded home. Co-written by Mike Flanagan (The Haunting of Hill House) and Kate Siegel (who plays Theo on THoHH). Directed by Flanagan and starring Siegel. This is more of a thriller than a straight horror pic and the plot may sound familiar, but it's a smart little B picture worth seeing. It's less a revisiting of the disabled-woman-in-peril trope than a story about a killer who decides to enact that trope and has underestimated his would-be victim. Co-stars Jim Gallagher, Jr. (The Newsroom, The Belko Experiment, the original stage production of American Idiot) as the would-be killer. After absolutely DEVOURING The House on Haunted Hill, I am super interested in all of Mike Flanagan's other horror work. And I loooooved Kate Siegel as Theo. She was my favorite character and I really enjoyed Siegel's work. Wow, this movie is good. I can usually handle suspense films pretty well but I had to take a break about 30 minutes in. Nothing groundbreaking, but incredibly well executed. I started watching this and had to turn it off about thirty or so minutes in (right when she realizes that the guy is watching her and has her phone). Kate Siegel is wonderful, of course, and I loved her friend (who is Steve's wife Leigh from THOHH!). The guy who is playing the killer is doing really good work with his body language. He radiates a kind of gleeful menace with just his head and shoulders. It's impressive. I really hate to say this as a fan of Mike Flanagan, but I wish he had never made The House on Haunted Hill because now everything is seen through that lens. I really enjoy his work like Absentia and Oculus (not so much Before I Wake). For those who liked House on Haunted Hill please watch his other works. PLEASE. I just saw this. I have been avoiding it awhile because I am just too terrified of this kind of thing, and I was expecting kind of unrelenting grimness because of Absentia and Oculus. And it was still pretty hard for me to take. It does something I really like, like Scream, where the bad guy can be harmed and even clowned on a little.